Configure a default gateway to be used. Start charging your members through your favorite payment provider. Examine the payment gateways OfficeR&D exposes to you via PayDock. In order for the integration to work, you will need to provide your PayDock credentials so the two systems can communicate. The credentials you need are API Secret Key and API Public Key. You can find them in your PayDock account by going to My Account/API & Settings. Copy the two keys and paste them into the dialog above, then click Authenticate. 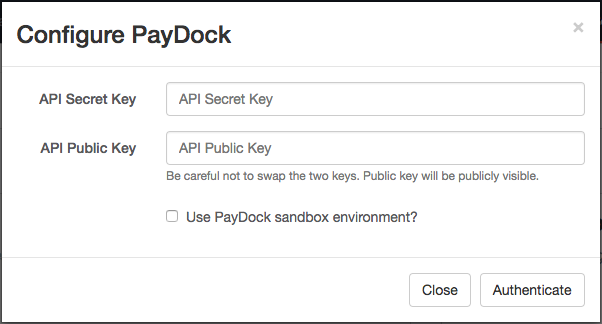 The Use PayDock sandbox environment? checkbox allows you to connect to a test account in PayDock. You can sign-up for a test account here and play around with it before using your real account. Once this is done you will be able to select each of the Gateways you have connected in PayDock. You can read more on what gateways are available and how to connect each of them here. Now you are ready to charge your OfficeR&D members through PayDock. All you need to do is enter their CC or DD details through the admin or let them enter those themselves through the Portal. Another option would be to Sync all your customers from PayDock into OfficeR&D. This can be easily done by going into Settings/Integrations, finding the PayDock integration and clicking Sync. This will effectively match all your PayDock customers to your OfficeR&D members and if their emails match will translate their CC or DD into OfficeR&D. Of course adding new member details into OfficeR&D will automatically add them to PayDock as well.